Our home is DOG FRIENDLY!!! Our home accommodates twelve people, four vehicles and two dog maximum. Our Lake Tahoe Vacation Rental is the luxury main house of a private estate. The house is a four bedroom three bath home with a large Hot Tub located on two acres along a private stretch of the Upper Truckee River in South Lake Tahoe at the foot of Echo Summit in Christmas Valley. This South Lake Tahoe vacation rental property is centrally located between Heavenly Valley Ski Resort, Sierra-at-Tahoe and Kirkwood, Located at the foot of Echo Summit in Christmas Valley, this vacation rental maintains the old Lake Tahoe experience with privacy and easy access. 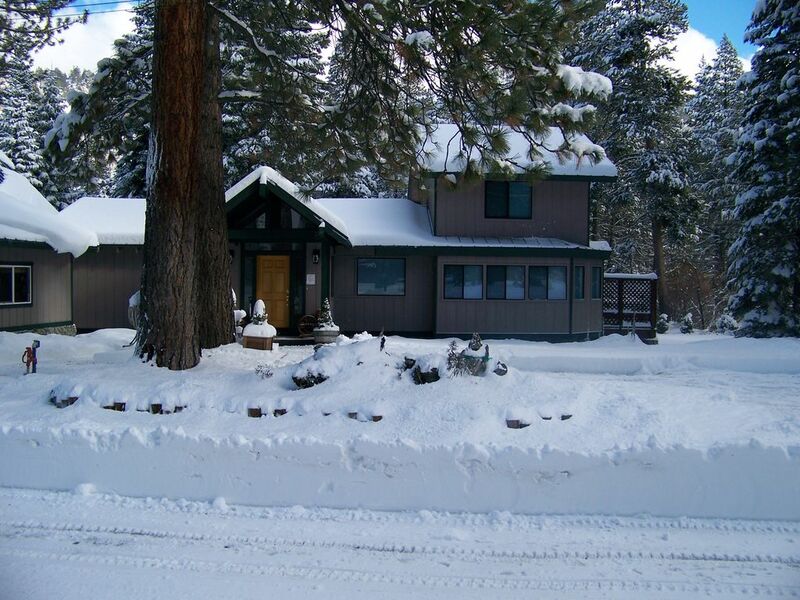 This South Lake Tahoe Vacation Rental property is perfect for private gatherings. The home sleep up to 12 guests. The yard is beautifully landscaped and maintained in a natural park-like setting. All linens, dish towels, bath towels are provided for your use. This home is professionally cleaned and the Hot Tub is drained/serviced/sanitized after each guest use to provide you the confidence that the home is clean upon arrival. Parking for four vehicles with snow removal provided. Massive lawn area with volley ball, croquet and access to the Upper Truckee River. Swings and cabin at the river. we were happy with the place, warm and accessible to everything you need, the children played super well. The place was great ! You couldn’t have asked for anything better. Lots of space to explore outside of the house. Inside very roomy with everything needed, it’s there. Drive to town for anything you need is a short 10-15 min away. Definitely recommend to anybody that’s looking for a nice getaway. I’m definitely going to rent again in the near future. All the property was well kept, close to the lake , great kitchen with tv in all the rooms and a big living room for all to enjoy together. Loved the river! Caught rainbow and brook trout. The grandkids swam and waded in the swimming hole. We had a great time. Our stay over the weekend was awesome the house was very clean and in a very private quiet area its nice and tranquil i recommend if you want some peaceful time with family. David very helpful and friendly. We had a great visit. Nice clean home, perfect for two families. We had a nice visit! in the river with easy access.